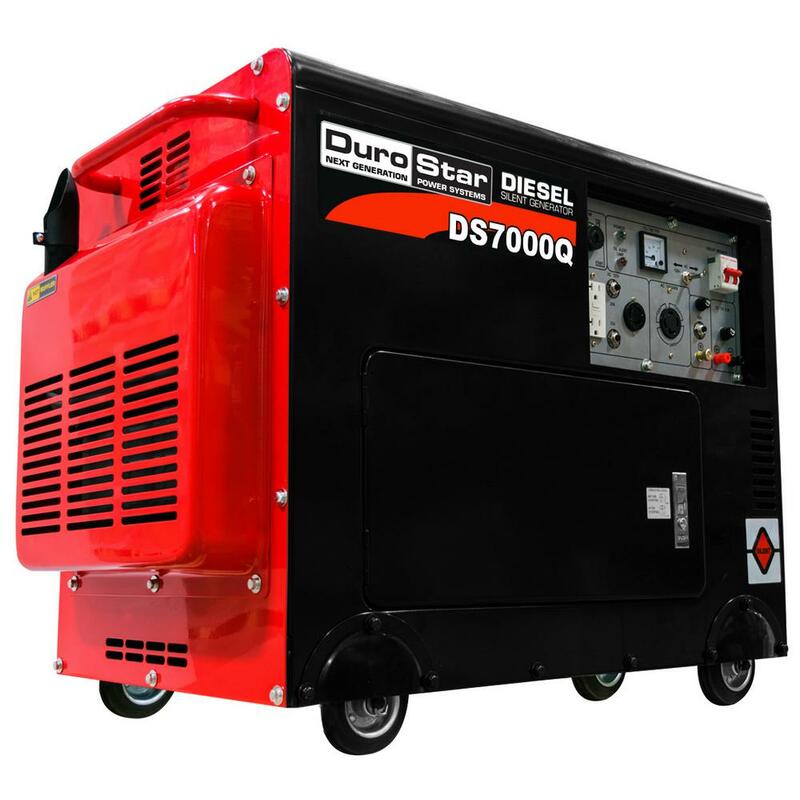 Ideal for use on farms and ranches, maintenance, construction, and even emergency power outages at home, the DuroStar DS7000Q diesel-powered generator cranks out an impressive 6,000 peak watts of power and a constant of 5,500 watts. It features a fully enclosed frame, and its combination of super quiet muffler and soundproofing help to reduce engine noise. The 4-cycle air-cooled, single-cylinder diesel engine uses an advanced direct fuel injection system for low fuel consumption, and it comes standard with a dependable, maintenance free alternator with automatic voltage regulator. The power panel features the main controls, including start switch, volt meter, and circuit breaker. It offers two 120-volt, 20-amp, 3-prong outlets (with ground fault interrupter) to supply power to all of your home appliances, plus two twist-lock outlets for high-powered tools: one 120-volt, 30-amp, 3-prong outlet and one 120/240-volt, 30-amp, 4-prong outlet. With the electric start, it's as simple to get this generator going as turning on your car. And with the wireless remote start, you don't have to stand over the generator to fire it up. The DS7000Q has a 12-hour run time at 1/2 load, and it has a 3.83-gallon fuel tank that also includes an easily readable gauge. The enclosed frame offers vibration isolation mounting between the engine/alternator feet and base frame to reduce vibration and improve durability. This generator is also easily portable thanks to the wheel kit. Other features include a super quiet muffler that reduces engine noise, built-in spark arrestor, and automatic low-oil shut off to protect the engine. Backed by a 1-year limited warranty. DuroStar 4-stroke single-cylinder direct injection engine. Remote start and/or Electric start for easy use. Dependable, maintenance-free alternator with automatic voltage regulator. Full-power panel with keyed ignition, oil alert automatic shutdown for low oil pressure, volt meter, circuit breakers, low fuel indicator and power outlets. 12 hours of continuous operating capability on a single tank of fuel. Fully protected 12-volt, 120-volt and 220-volt outlets. Ground fault interrupter 120-volt outlet (GFI) for safe operation.